My parents took me to SeaWorld San Diego and SeaWorld San Antonio several times when I was a child. But even though I loved getting to see the orcas up close, it always bothered me that these majestic creatures were confined to such small tanks. As it turns out, this bothers quite a few people, people who have the power to do something about it. The era of orca captivity is coming to an end. “People are starting to realize that we should not be keeping these large animals in marine parks, in what is to them, a bathtub,” says Deborah Sivas, a professor of environmental law at Stanford University. In mid-October, the California Coastal Commission announced a ban on the breeding of SeaWorld’s orca population, citing orcas as “a marine resource and a species of special biological significance.” SeaWorld responded that it planned to challenge the commission’s ruling on the basis that animal welfare is a matter of federal jurisdiction, not local. In response to that challenge, Rep. Adam Schiff of California proposed a new federal bill called the Orca Responsibility and Care Advancement (ORCA) Act in November. If passed, the bill will make capturing, importing and exporting orcas illegal in the United States. This could render marine life parks in the United States, particularly SeaWorld, out of date. “Unless SeaWorld changes its business model and moves toward that of an amusement park, it will quickly become obsolete,” says former chair of the California Coastal Commission Sara Wan. SeaWorld has faced building accusations of animal rights and human welfare violations surrounding its orca shows since 1993, when the Humane Society of the United States launched a campaign to end public displays of orcas. The team behind “Blackfish” investigated the death of Brancheau, exploring both Tilikum’s harrowing past and the history of SeaWorld’s captive orca practices. Tilikum, in addition to killing Brancheau, was previously involved in the death and injury of two other people. SeaWorld declined to comment for this article, but has previously blacklisted the film as “propaganda, not a documentary,” yet SeaWorld gave little proof to support this claim. Propaganda or not, “Blackfish” received positive critical reviews and has had a tremendous impact on the future of SeaWorld and other marine life parks. “‘Blackfish’ is absolutely a cause of the ban because it facilitated a debate that had never existed before,” says Naomi Rose, a biologist with the Animal Welfare Institute. “Blackfish” also had a huge impact on SeaWorld’s potential audience. Combined with OSHA’s ruling that they cannot have trainers in the water, SeaWorld needed a new way to draw visitors. SeaWorld hoped to draw new audiences to the park with the expanded facility because they can’t do the same shows anymore. But even though the commission is concerned with preserving the California coast, SeaWorld falls under the commission’s jurisdiction for a number of reasons. SeaWorld breeds its orcas in captivity. But even so, new genetic material needs to be introduced to prevent inbreeding. As in humans, inbreeding in orcas occurs when closely related members of the species breed. Inbreeding can lead to genetic deformities, which is why you don’t want to marry your first cousin. “Nobody who is conducting a responsible zoological breeding program would have [this much] inbreeding,” says Rose, in reference to SeaWorld’s orca population. 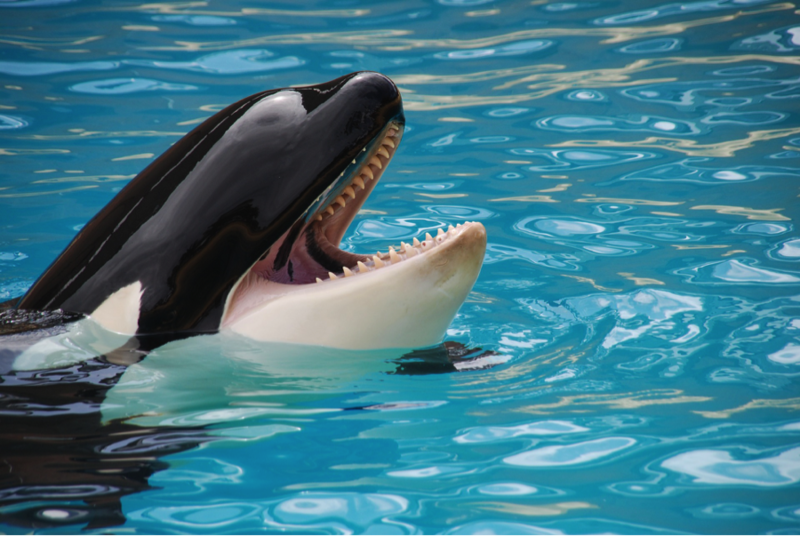 “The problem of orca inbreeding creates a market for the removal of orcas from the wild,” says Wan, because new orcas must be brought in to maintain genetic diversity among the whales. When SeaWorld came before the commission in August 2015 with plans to expand its orca facility, the park specified that these new, bigger tanks would be used for breeding. The commission approved the expansion and nixed the breeding. Although SeaWorld announced that it intends to sue the commission, it might not have much legal ground to stand on. “SeaWorld uses water from the California coast, a coastal resource, in its tanks, which subjects it to the Coastal Commission’s authority,” says Sivas. “SeaWorld is claiming that the commission is stepping into territory they have no authority over,” Sivas says. “But these marine mammals and the water in their tanks are coastal resources.” The language of the Coastal Act provides for a broad interpretation of the commission’s power. Ironically, SeaWorld may have brought the ORCA Act on itself by claiming that the animal welfare regulations fall under federal, not state, jurisdiction. If the bill passes, all three SeaWorld parks will have to end their breeding programs and cease orca performances, not just SeaWorld San Diego. If so, when I have children of my own and they want to see these majestic creatures up close, we will have to visit them in their natural habitat along the California coast — not at SeaWorld. Any country that wants to call itself civilized should be setting an example to the rest of the world by banning all import, breeding in captivity and entertainment performances by wild animals, especially our leviathans and pachyderms. America has now ordered 18 wild elephants to be captured in Africa and separated to live long, isolated lives of misery in American zoos. Why is this permitted? Unity Consciousness, Awakening, Love, Understanding and taking responsibility for All Life of All Beings! We are All One. Infinite love. Thank you. taking animals at all is not ok why does man think they can destroy and take anything and everything. nature is completely balanced man has depleted every species of animal that lives on earth. When is any one going to quit making stupid useless laws with a million back door policies and just outlaw all animal capture period!! !